As you may know, Mars is the Roman god of war which makes this an interesting title for a book by a Christian pastor. On the other hand, interesting books deserve interesting titles and this is a quite amazing book. 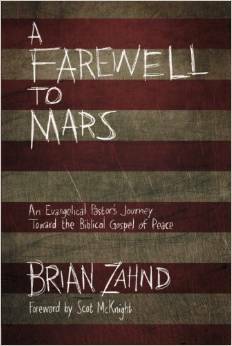 Author Brian Zahnd clearly and passionately makes the case for Christians to actively follow Jesus’ way of non violence. Jesus’ life, death, and resurrection changed the world and thus we are to be peacemakers here and now. Zahnd does a good job pointing out and demonstrating the ways we combine and confuse Christianity with patriotism and how easily we assume that US military action is appropriate and right. This was Brian Zahnd’s assumption for much of his life. The most interesting and wonderful thing about this book is the story of Zahnd’s conversion from a Christian American to a Christian who lives in America. He was serious and intentional about Bible study, prayer and spiritual disciplines and God changed him. Zahnd has made a 180 degree turn from someone who believed that military action especially by America was necessary and right to an advocate for non violence. Do make this change is not easy for any of us, but for the pastor of a large church to publicly make this turn requires serious commitment to a different kind of gospel. Zahnd calls us to a faith in Jesus that is (to borrow the phrase) personal but not private. His understanding of the kingdom of God and Jesus’ message doesn’t stop at personal salvation but recognizes that God intends to save the world. Zahnd draws on history, literature, and most importantly good Biblical exegesis to make the case for non violence as the way of Jesus. This book is not a measured polite call for us to talk about peace. This book is a passionate and forceful call to conversion. Zahnd is preaching with conviction and power. If you think these quotes from the book make sense, you will enjoy this book. If you don’t understand or find these quotes offensive, you need to read this book. Posted in Book Reviews. Tagged Brian Zahnd, Farewell to Mars. Next: Next post: Wasteful or Extravagant?